Friday marked the one-year anniversary of an Iowa basketball milestone: its most recent home loss. IOWA CITY, Ia. — Friday marked the one-year anniversary of an Iowa basketball milestone: its most recent home loss. Yes, 15 opponents have come into Carver-Hawkeye Arena in the past year, and all 15 have lost. The last one to win? Sunday’s 6:30 p.m. opponent: Minnesota. So even though the Golden Gophers have lost 13 games in a row, they have the Hawkeyes’ attention after last year’s 64-59 win here. Plus, No. 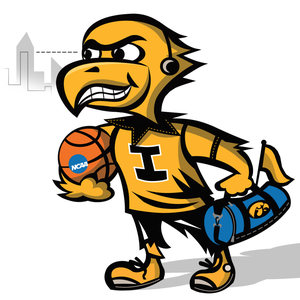 5 Iowa (19-5, 10-2 Big Ten Conference) is determined to rebound from Thursday’s emotional 85-78 loss at No. 22 Indiana. “We got beat by them last year,” Iowa coach Fran McCaffery said. “It’d be different if in the last five years, we killed them every time we played them. Signs of trouble under third-year coach Richard Pitino surfaced in December, when the Gophers (6-18, 0-12) lost back-to-back home games to South Dakota and South Dakota State. But Minnesota isn’t way off — nine of its losses during the current losing streak are by single digits. McCaffery can empathize with Pitino. Tickets: As of Friday afternoon, only about 200 remained. Game notes: Iowa has won its last nine home games by double-digit margins. … With wins in five of their final six games, the Hawkeyes would set a school record for Big Ten victories in a season (currently 14, set in 1969-70 and tied in 1986-87). … Center Adam Woodbury has 44 rebounds in his last three games. … Minnesota’s Joey King leads the Big Ten in free-throw percentage (.881); Nate Mason ranks third in assist-to-turnover ratio (2.7).